The Phillies salvaged a four-game split today by mashing the Brew Crew on their way to an 8-0 victory. The win allowed the Phils to finish their road trip at 4-3. – There is a strong belief among many fans and pundits that Kyle Kendrick would be better served pitching out of the bullpen. The numbers certainly back that up. On the season, before today’s game, he had a 4.53 ERA. But pitching as a reliever, it dropped down to 3.95. But it is well-known that Kendrick prefers to start. Maybe he’s trying to make his case to remain in the rotation. In his last start, his seven shutout innings made up what was probably his second best performance of the season, behind only his complete game shutout. Today, he’d outdo himself, continuing to sling zeroes, this time for eight innings against a very good Brewers offense. – Kendrick allowed just three hits, while striking out seven and walking one. He retired eleven in a row through the middle innings and was particularly effective against Ryan Braun, who went 0-for-3 facing the right-hander with one strikeout. It’s worth noting that Kendrick did receive a stroke of luck today, seeing how he had a 60% fly ball rate, but allowed no home runs against a home run-hitting offense. Still, goose eggs are goose eggs, and that’s all KK threw up on the scoreboard. He has now thrown fifteen consecutive scoreless innings. You’ll recall he twirled a career-high 22 consecutive scoreless innings earlier this summer. – Today’s lineup was, shall we say, unconventional. John Mayberry hit third, Ty Wigginton played left field and hit fifth, and Michael Martinez was in the seven hole. If the Phillies were going to score some runs, they would need some unlikely heroes to step up and get the job done. And that’s just what they got, amassing fourteen hits and eight runs. – Mini-Mart got the scoring started with a two-run home run in the second. The bomb was just his second of the season and fifth of his career. 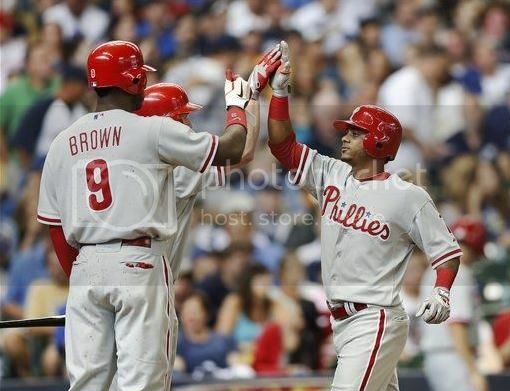 – In the third, the Phils loaded the bases in front of Domonic Brown, who hit a bases-clearing double. Though Brown has shown a lot of patience at the plate so far–seeing four pitches per plate appearance coming in to today’s game–he’d be more aggressive on his double, hitting it on the second pitch of the at bat. The hit had to feel good for Brown, as he had struggled lately. (He was just 3-for-20 over his last five games). He also drove in a run with a single in the eighth. It’s important to remember not to be too critical of Brown when he struggles and too officiously praising when he does well. You can’t put too much stock in any single game, but instead must wait to see the whole picture at the end of the season. Today, he did a lot of good things, going 3-for-4 with a walk and a run scored on top of his four RBI. – Brian Schneider, who has fallen by the wayside lately in lieu of Erik Kratz, also contributed to the Phillies scoring with a two-run double in the seventh to make it 7-0. It was Schneider’s second hit of the day in four at bats. – Final tally: Eight RBI from three guys who were not projected as starters when the season began. That’s kind of the season it’s been, huh? -The Phils return home tomorrow when they start a four-game set with the Reds. Roy Halladay takes the mound against Mike Leake. – The Phillies are now 11-8 since trading Shane Victorino and Hunter Pence. So, take that for what it’s worth.